If you’ve grown weary of the relentless, can-do attitude of your action figures, perhaps it’s time for a playdate with a sad Keanu Reeves, whose stooped, defeated frame will remind them that they—that we—are all just toys in the hands of an easily bored and fickle child called “life.” Toy designer Nancy Liang has crafted the Sad Keanu doll, based on the persistent Internet meme photo of Reeves eating a sandwich in what appears to be a glum, contemplative solitude, years before he would even make 47 Ronin. Reeves himself kept the meme going with his tongue-in-cheek book of morbid prose, Ode To Happiness. Now Sad Keanu has made his way back into the tangible world thanks to 3-D printing service Shapeways, where you can buy one of your very own in either “teeny” ($25) or regular ($45) size, depending on how large the abyss is within you. Like the casting of Keanu Reeves himself, the possible uses of Sad Keanu are endless, even if he always hits the same basic notes. 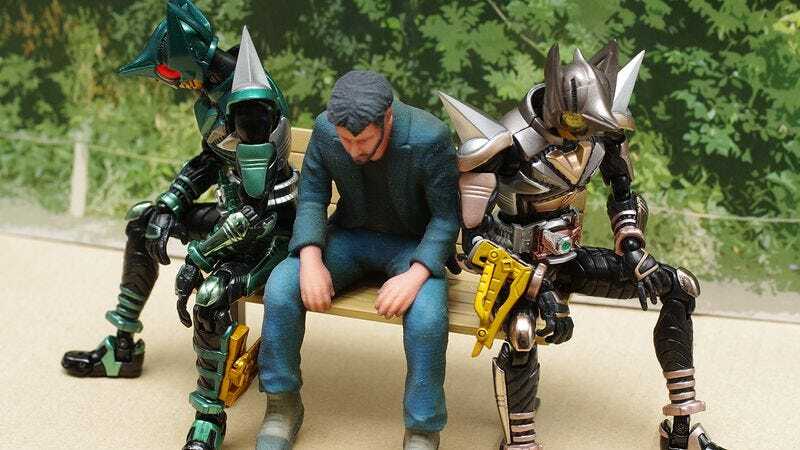 Place Sad Keanu amid your Transformers, as a reminder to Optimus Prime et al. that they may change their shape, but they can never escape who they are inside. Move him into the master bedroom of Barbie’s Dream House, where Keanu’s unshakable dolor will force her to question whether amassing material goods is really a “dream.” Replace your played-out Elf On The Shelf with a Sad Keanu that will also keep an eye on your kids, then report back to Santa that their behavior, good or bad, really doesn’t mean much in the grand scheme of things. Or recreate one of these scenarios from Japanese toy builder idk. You can’t go wrong, because there is no wrong. There is only endless, inescapable, life—or its hollow, plastic facsimile.